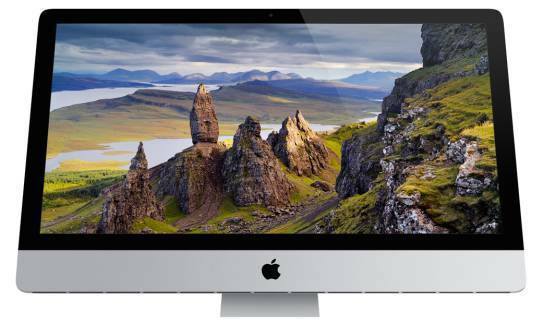 The refurbished Late 2013 27-inch iMac has a fourth generation Intel Quad Core i7 processor running at 3.5GHz. That makes this the fastest iMac produced by Apple in Late 2013. And its the only 27-inch iMac from Late 2013 that has a Quad Core i7 processor. This is the iMac your want for graphics and video production, watching movies and intense game playing. The pre-owned Late 2013 27-inch iMac also looks really cool from the side. Its only 5 mm wide at the edge. But its still packed with features. It comes with USB 3 ports, extremely fast Thunderbolt 2 connections, an SDXC card slot and fast 802.11.ac Wi-Fi. And you can save on this powerful pre-owned 27-inch iMac desktop when you shop at GainSaver. Well save you money and protect your investment with our 30 Day Money Back Guarantee. Weve got you covered! The display on the pre-owned Late 2013 iMac has been redesigned to reduce reflection by 75 percent compare to previous iMac generations. That means there is less to distract you from the amazing picture you get on the refurbished 27-inch iMac display. In addition, the Late 2013 iMac has the LCD moved up closer to the glass cover, making images feel like theyre jumping right off the screen. And when youre doing graphics design and video production tasks, youll appreciate the high contrast and rich, vibrant true-to-life colors. Youll really blast through all your work  and play  with the fourth generation Intel Quad Core i7 processor driving the refurbished Late 2013 iMac. And when you need it, the 3.5GHz processor can kick it up to 3.9GHz using the Turbo Boost 2.0 feature in the fourth generation Intel processor. Each core in the processor is able to process instructions independently, so theres never a wait for the processor to catch up. And with Hyper Threading support in the Mac OS, you actually get eight virtual cores processing at once. All those cores add up to a one really fast iMac. The FaceTime HD camera is perfect for getting everyone around you in the picture when you make FaceTime calls with your refurbished 27-inch iMac. If you like using FaceTime, youll love it with FaceTime HD and its 720p image. In addition, the sound quality on the 27-inch iMac is really amazing. Sitting in front of the pre-owned 27-inch iMac screen and playing games or watching movies is a totally immersive experience. Even when playing your favorite music and listening from across the room, youll still notice the difference with the high fidelity speakers that come built in. The refurbished 27-inch Late 2013 iMac gives you a high performance Intel Quad Core i7 processor, fast NVIDIA graphics card and monster display that is dazzling to look at. Youll be watching movies, playing games, editing videos, manipulating images and much more. All those things take up a lot of hard drive space. So make sure to upgrade your pre-owned iMac to the memory specs and hard drive capacity youll need. When it comes to hard drive space, more is always better. No matter how much space you think youll need down the road, you will actually need more than that. So make sure you get the affordable hard drive and memory upgrades from GainSaver that are installed by professional technicians. Once youre decided on your refurbished Late 2013 iMac options in the Configurator, click the Buy Now button to add it to the cart.